Or view larger version. Maidu Walk. 1980. Dalbert Castro, artist. Acrylic on canvas. Collection of Oakland Museum of California. Gift of the Aeschliman-McGreal Collection. In 1862, the Konkow Maidu people of Chico and the Atsugewi people of Shasta County were forced by the U.S. government to move to the Round Valley Reservation. At the reservation, American settlers attacked and killed 45 Native people. Survivors fled in terror back to Chico, but were forced by the government to return to Round Valley. 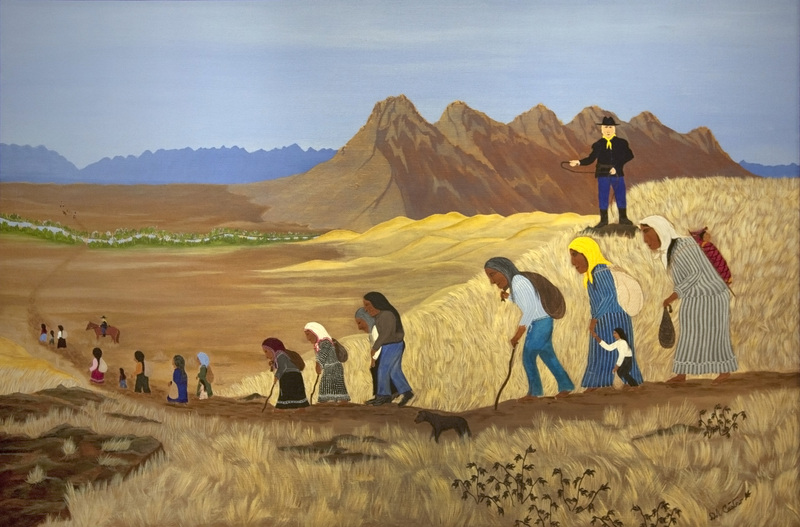 This painting tells the story of the second trek back to the reservation over hot, rugged landscape. Dozens of people died or were left sick along the way. In the painting, the people march westward in sight of the Sutter Buttes, a place of power for them.